List of Important Entrance Exams for Engineering in India? what are the important engineering entrance examinations in India for 2012 ? List of important Engineering Entrance Exams in India? Important Engineering Entrance Exams in India? List of entrance exams along with their last date of forms submission, through which I can get admission in various engineering courses in India? Is there any entrance exam held in India for studying abroad after 12th? Which are the good colleges for Mass Communication in India? Important dates of the entrance exams and how to prepare for the exam? List of the entrance exams of Aerospace Engineering in India? List of top engineering entrance exams in India? 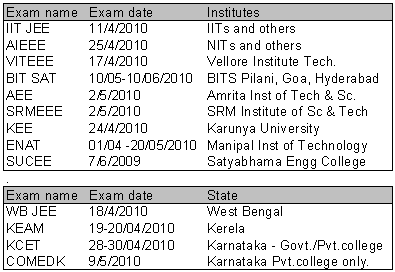 List of Engineering Entrance Exams held in India? Information regarding when to get application forms and last date for the submission of application forms for these Exams? List of colleges in India and abroad offering M.Tech program in Genetic Engineering? List of entrance exams for PG and the fee structure of those colleges? Engineering entrance exams important topics? What should I do after 12th with PCMB so as to become a Genetic Engineer? Entrance exams which are held to get in Marine Engineering B.Tech course? List of good Marine Engineering Colleges in India? List of important Engineering Exams? When to get applications for these Exams? List of colleges which offer MS course in India? Entrance exams to get admission? List of medical PG entrance exams in India? How to apply for ITI Apprentice exam? Last date of application? Re: List of Important Entrance Exams for Engineering in India? Lal Bahadur Shastri College of advanced Maritime Studies and Research, Mumbai. etc. Separate application is required for the colleges except IIT, ISM and IT-BHU. IIITs and many more govt./private institutions. in Pilani, Goa and Hyderabad. 4. MIT Manipal engineering entrance exam. engineering programs at MIT Manipal. importance because govt. seats are reserved for the students of state only. So, you should surely apply the State Engineering Entrance Exam of your state. most of the younger aspirants wish to become either engineer or doctor. But getting into the field is not a easy job. One need to face entrance exam and perform well in order to get into the course. The various entrance exams are AIEEE, IIT JEE, BITSAT, etc. In certain states like Tamil nadu admission to the course is based on the marks secured by the aspirant in +2 exam. AIEEE IS A national level entrance exam conducted every year in the month of april for admitting the aspirants to the various engineering colleges in India. IIT JEE is also a national level exam but through it the aspirants are admitted to the IIT branches in India. BITSAT is conducted for admitting aspirants to the three colleges under it. Vitee conducts exam for admitting the aspirants to the vellore institute of technology. Aspirants from various regions apply for the exam and it is one of the top engineering colleges. And also many other exams are conducted to admit the aspirants to the colleges under them. 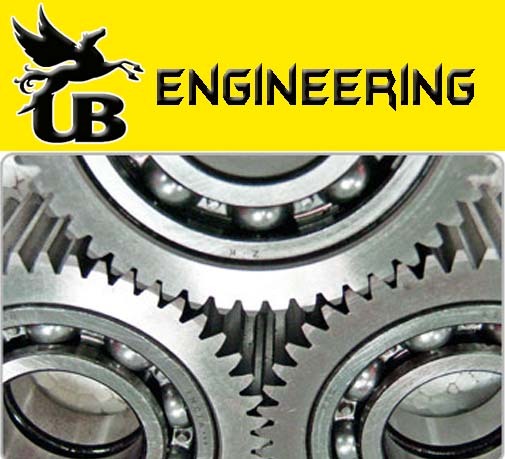 This help in admitting the aspirant with skill to get into the branches in engineering. you can go for any of these exam..
After qualifying in any of these exam you will be able to take admission in engineering course. >> IIT JEE :- Considered to be the toughest and the most prestigious engineering entrance exam for admission to various IITs,IISc,IISER,IT-BHU Varanasi,ISM Dhanbad and many more institutions take candidates on the basis of their IIT JEE rank in the merit list or extended list..
>> AIEEE (All India Engineering Entrance Exams) :- Perhaps the second best after IIT JEE but covers a wider range of colleges all over India including NITs,PEC,DCE,NSIT,BITS Mesra,IIITs and many more..
>> BITSAT (BITS Admission Test) :- A purely online exam conducted every year for admission to the three campuses of BITS namely BITS Pilani Rajasthan,BITS Goa and BITS Hyderabad..
>> KIITEE :- Conducted for admissions to Kalinga Institute of Industrial Technology Bhubaneshwar,Orissa..
Other than these exams..almost every state conducts its own exam for admission to various colleges in its territory.. Above are the famous entrance exam for admission to well known colleges. For any other query , please write here with details. MIT Manipal engineering entrance exam. MP-PET is the Pre-Engineering Test for admission to Engineering Colleges in Madhya Pradesh, India.It is conducted by Vyapam, the Professional Examination Board of Madhya Pradesh. Vyapam has been coducting the MP-PET since 1981. PET is based on syllabus of subjects Physics, Chemistry and Mathematics of +2. MP PET format of exam paper is objective type questions with single correct choice. The marking equation is (2R-W) where R is for the count of right answers and 'W' is for the wrong.. There are two papers of 2hrs and 100 questions each. One paper is of Mathematics and other is combined paper of Physics and Chemistry. Use of mobile phone, calculator, log or rough paper is not allowed. YES OF COURSE, a student that is belonging to the other states can also apply for the MP-PET test. this is not only for only MP , but also for the other states that any student that belongs to the other state can give test in other state. IIT-JEE-->>This is to get entrance in various IIT's in India . AIEEE-->>This is to get entrance in various NIT's in India . BITSAT-->To get entrance in BITS . ISAT-->>To get entrance in IIST , Banglore . as per my knowledge IIT-JEE having more value then after AIEEE and other institution like BITS-PILANI are arranging their know examinations.. There are many engineering entrance exams in India. IIT-JEE, AIEEE are the two most important exams among those. 5.MIT Manipal engineering entrance exam.